“Jimmy’s” – the name doesn’t need the word “pie”. Everyone knows exactly what you’re talking about. Every week day, thousands of these revered pies leave Roxburgh and make their way to dairies throughout the lower South Island. The Kirkpatrick family moved from Invercargill to Roxburgh in 1960. At the time, there were 13 bakeries in the area. However, the mass production of bread hit all of them hard. Denis’s father Jimmy quickly recognised that a niche business was the way to go. Today, Jimmy’s grandsons – Daniel, Bernard and Oliver – are also fully involved in the business. The business was originally called Jimmy’s Bakery. But Dad changed it to Jimmy’s – he said ‘one word – it’s easier to remember’. He’d be amazed that it’s still going strong. As kids working over Christmas time, we’d do 100 dozen pies a day. Now it’s 20,000 pies per day. As a young man, I was in the banking industry for five years, but I could see fast food coming along. I thought I’d come down home and help my Dad. I like cooking and baking – it’s in the blood. Dad died in 1976 and Jean and I took over – and now it’s the boys. It’s nice having your family involved in the business and sharing the load. Learning from past experiences, with future generations in mind, has set many a Central Otago business on the path to success. The Kirkpatrick family are no different. The best example of that is the fact they have consciously kept the Jimmy’s pie recipe unchanged for more than four decades. The recipe’s not written down, but the boys know it. We keep it the same and we don’t change our ingredients. People like it that way. We have kids and their grandfathers coming through and the grandad will say that the pies are just the same – that they haven’t changed a bit from when he was a kid himself. It’s a good, basic, quality pie that’s made from the best of ingredients. The folk of Central Otago are known for being friendly, open and honest. Take Denis’s father Jimmy: he believed in integrity above all else. We had a customer with a wee shop in Invercargill and he’d get a dozen pies off us, once a week. Other suppliers didn’t go near him, because he wasn’t buying enough. Then one day he bought the biggest milk bar in Invercargill. He threw out everyone else’s pies and only stocked Jimmy’s. Customer service is a big thing for us. If something goes wrong, there’s no argument. We just take it away and replace it. We’ve been with some of these customers for 30 odd years. They look after us and we look after them. Denis recognises the value of respect within his Central Otago community. For more than 40 years, the people of Roxburgh have embraced the business and his family have embraced Roxburgh. Today, Jimmy’s and Roxburgh are synonymous. 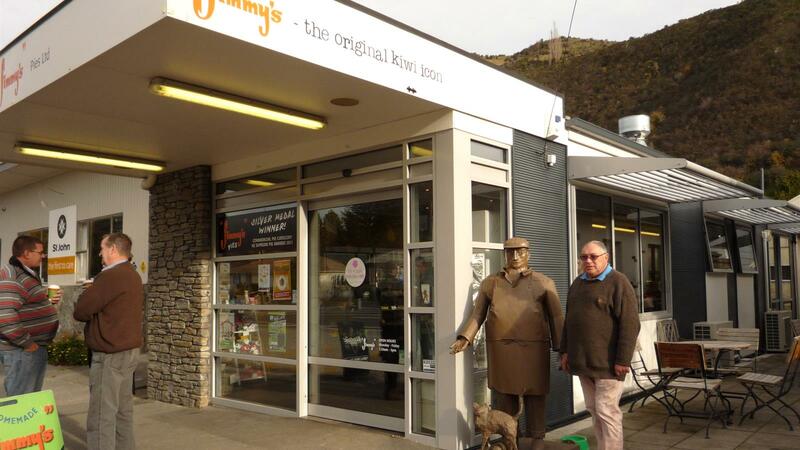 Jimmy’s employs 38 people – that’s 38 individuals that live here around Roxburgh. They’ve got houses here, they pay rates and many have kids going to school, which helps keep the school going strong. If the population’s up, it also keeps the doctor here. These are the sorts of things you’re mindful of. We’ve got pride in the community and the community has pride in us. People from around here go overseas and say they’re from Roxburgh, the home of Jimmy’s pies.